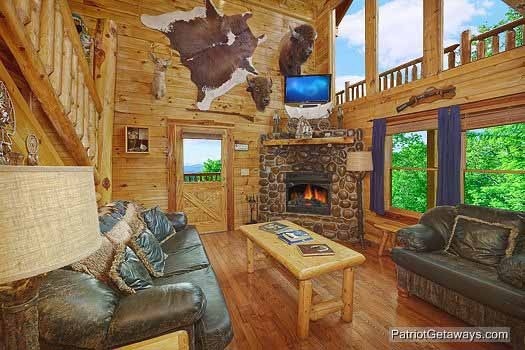 A wild time is waiting for you in Wild Bill's Hideout, an Incredible custom built two bedroom three bath log cabin, tastefully decorated in a Cowboy and Wilderness theme with lots of rustic style and charm. 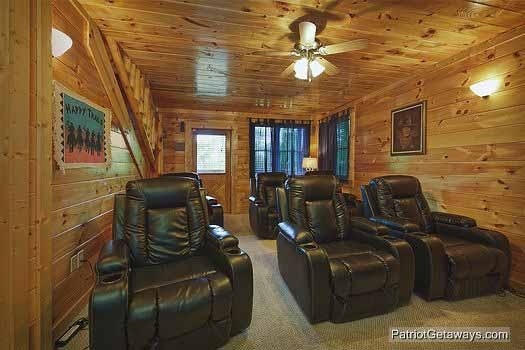 With custom Cedar, hand crafted wood work throughout the cabin, a Fully equipped kitchen, Washer and dryer, living room 50" HD TV, PLASMA FLAT SCREEN TV's in both bedrooms and the loft, A ONE OF A KIND THEATRE ROOM with a 70" BIG SCREEN HIGH DEFINITION TV with DVD, VCR and Surround system. Master Suite boasting a Jacuzzi tub custom King size Log Bed, beautiful Gas Fireplace, large open Loft with Pool Table and full bath. 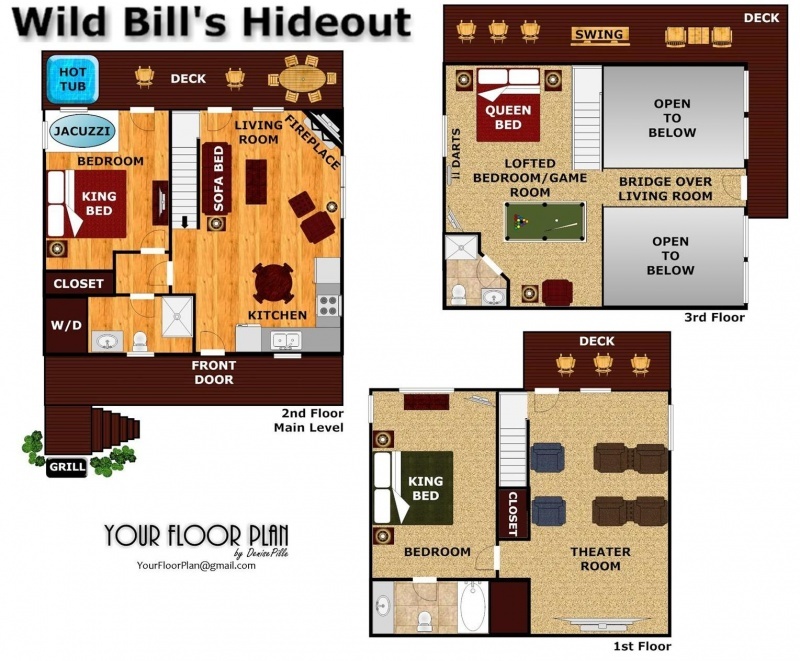 The lower level boasts a second bedroom with a custom KING size log bed and full bath along with the Amazing Theatre Room on this level. 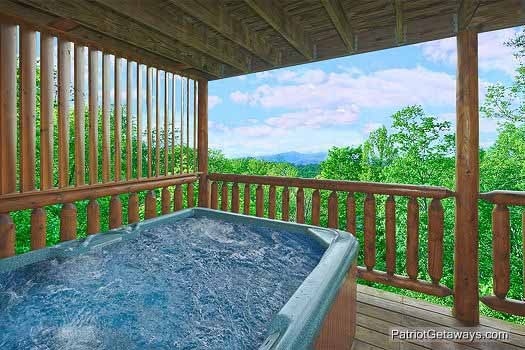 Enjoy a dip in the 6 person Hot Tub while enjoying the wonderful views of Pigeon Forge and the mountains or watch your favorite movie in your very own theatre. YOU WILL NOT BE DISAPPOINTED!!! 3x using you guys and have loved it every single time! Will hopefully be back at the end of the year!!! We had a great vacation, we loved the cabin. Thank you so much, happy new year. Cabin was amazing, my family enjoy it and will definitely visit again. Cabin was just what we needed! Very relaxing stay. Perfect location! We cant wait to come back! 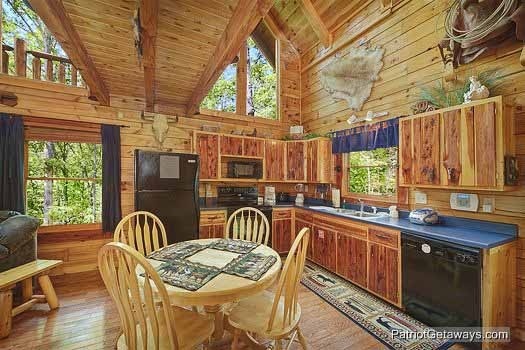 Beautiful cabin! We had a great time and loved the hot tub and theater room. 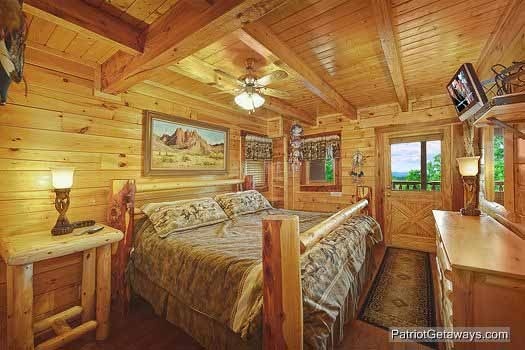 I've booked with American Patriot Getaways for four years now and stayed in a different cabin each time just for a different experience. They've all been wonderful stays. 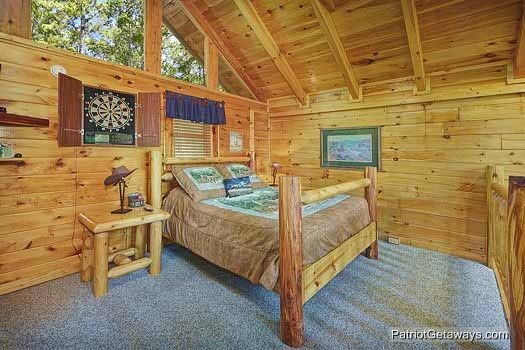 The staff is always helpful when I need to narrow down the options, the cabins have been clean and I've always known what to expect based on the website. I'll be booking with y'all again next year! 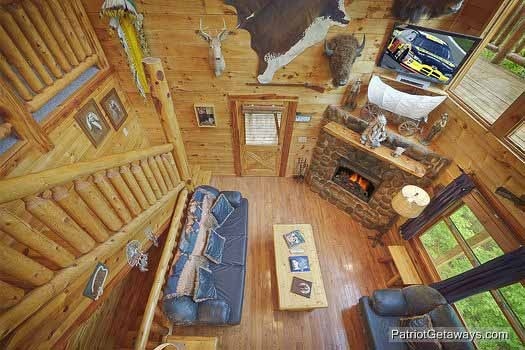 Love this cabin!! 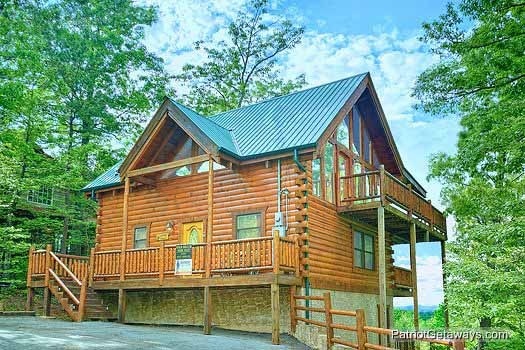 Have stayed in several others but I will definitely be back to this cabin it was great!! The family absolutely loved everything about it!!! This was our eigth stay with APG. 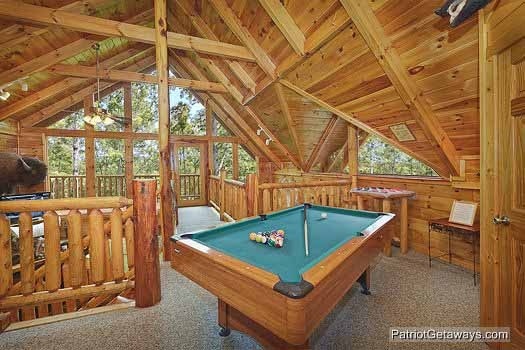 We've stayed at several different cabins and will defiitely return to this one! 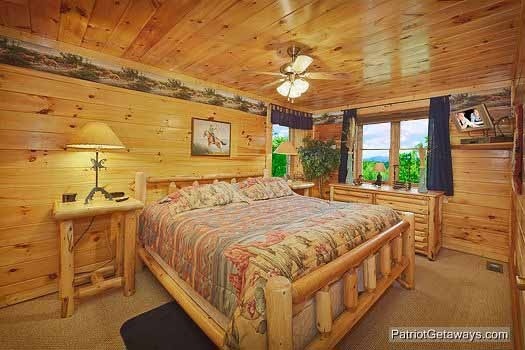 Both bedrooms were equally nice (both king beds and separate bathrooms). 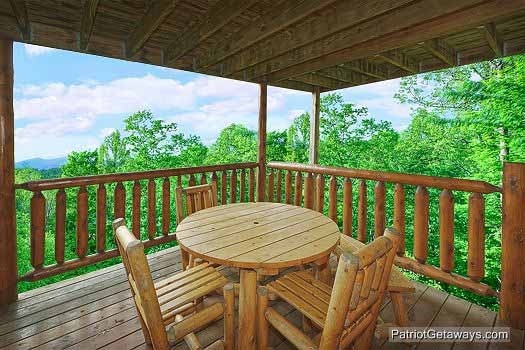 The cabin had three decks to sit out on and enjoy the scenery. 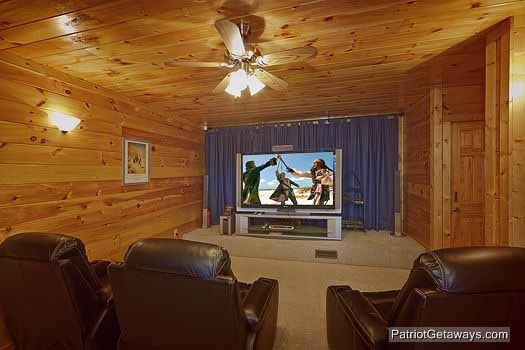 The theater room was an awesome way to wind down after a long day playing! 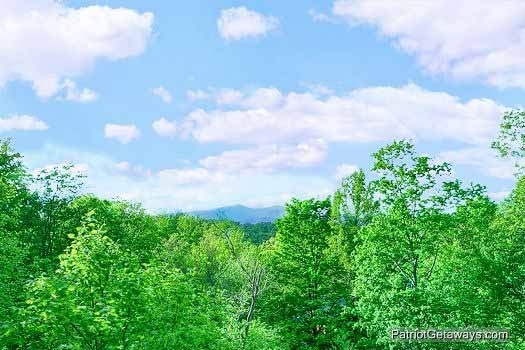 We have stayed many times with Patriot Getaways and has always been great. Plan to again. I traveled here with my 3 kids ages 18, 16, 12. We were so excited for our first trip to Pigeon Forge and Gatlinburg. When we arrived at our cabin we were all so surprised at how wonderful it was. My kids enjoyed themselves so much, they wanted to spendas much time at the cabin as they did sight seeing. Thank you for making this vacation a wonderful experience! We will be coming back! The cabin was very clean when we arrived. 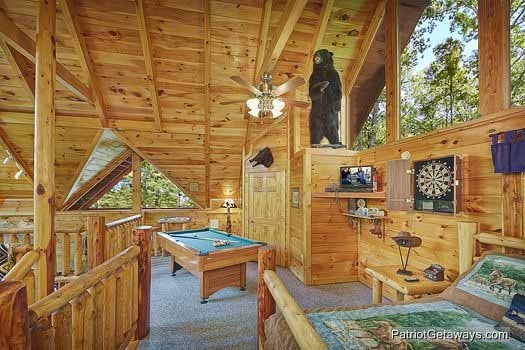 Great get away cabin, Enjoyed it a lot. We loved our stay at Wild Bills cabin! We had a great time and would love to come back again sometime. Highly recommended! The cabin was great! Clean, well decorated, plenty to do. Movie theater room was wonderful and we used this more than anticipated. Loved the hot tub and views. Absolutely just a 100% experience for the entire weekend. 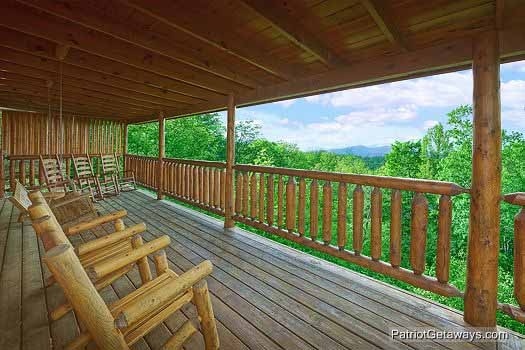 This cabin is one of the best we have ever stayed in and we would definitely return. Wish we could have stayed longer. Thank you for making this a great choice.